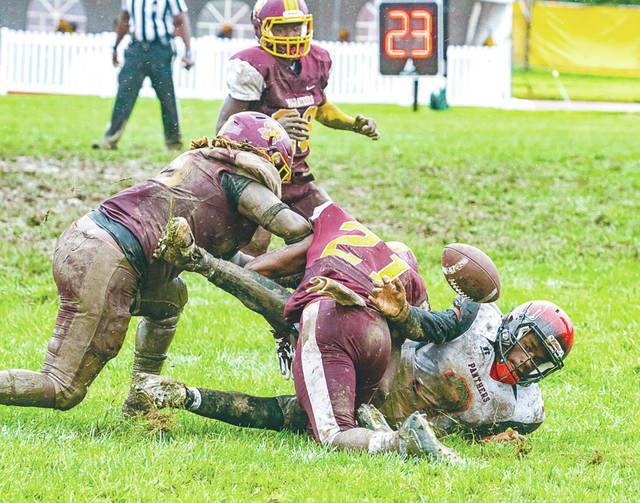 An unidentified muddy Marauder tries to get onto his feet and out of the midfield slop, during the rainy first half of Saturday’s Sept. 7 college football game between host Central State and visiting Clark Atlanta, at McPherson Stadium in Wilberforce. Clark Atlanta defenders Makell Young and Ronnell Jackson tip a punt by Central State’s Isaiah Smith, Sept. 7, in the first half of a college football game at McPherson Stadium, on the Central State University campus, in Wilberforce. Central State’s Eric Michael-Smith shares a laugh with Jerrell Allen after Saturday’s Sept. 7 win, 7-0 over visiting Clark Atlanta. Almost completely covered in mud, CSU junior linebacker Samy Jean flashes a ‘V’ for victory sign after Saturday’s Sept. 7 college football win over Clark Atlanta at McPherson Stadium. Clark Atlanta running back Charles Stafford (3) flails at a loose ball in the first half of Saturday’s Sept. 7 college football game against host Central State in Wilberforce. Clark Atlanta fumbled the ball 12 times in a 7-0 loss to the Marauders. WILBERFORCE — Yeah, I know. It’s only Week 2 of the college football season. But using those two weeks as a gauge of what Central State football fans could possibly expect, there might be a lot of good days like Saturday’s 7-0 win over Clark State. Just hopefully with a little less mud. 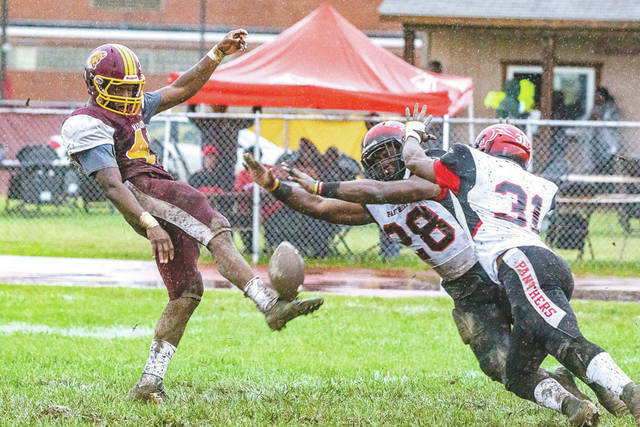 The first hint of a different attitude in Marauder Maroon and Gold came after the lightning shortened 19-10 road loss two weeks ago on the road to Elizabeth City State. A week later, there was still grumbling in the McPherson Stadium pressbox over how the game ended — a lengthy lightning delay, right after ECSU scored, with the game never restarting. In past years, the CSU faithful might’ve chocked that up as just another tough loss on the road. Not this year. Maybe it’s just remnants of that early season optimism that pervades nearly every college campus at this time of the year, where the local pundits have a feeling that this could be their year for success and lots of wins. Or maybe it’s based on the way this Central State team is playing football so far. I know it’s Week 2, but I’m going with the latter. 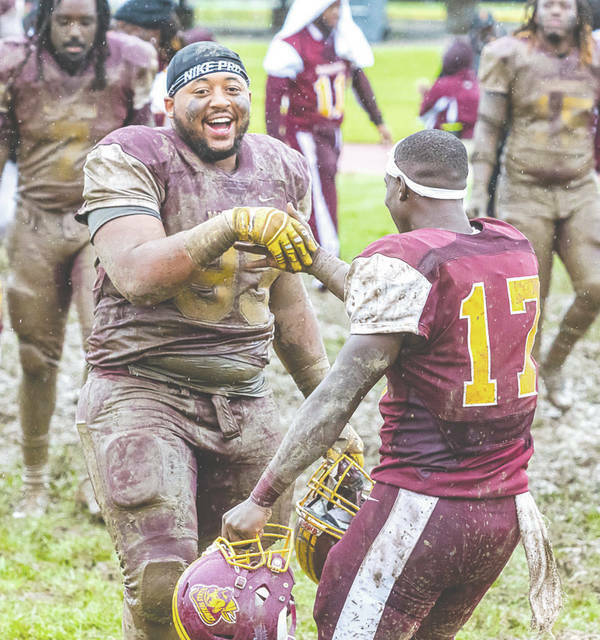 From what I saw and heard on Saturday in the McPherson mud, these Central State players believe in themselves. You could see the intensity in their eyes. You could hear the desire in their voices. Moss was a little less muddy after shaking each reporter’s hand. “The first thing I had to do was hold the ball, then I just put my trust in the offensive line,” said Marauders running back Jerry Lanier who led CSU with a whopping 32 yards gained through the slop, including the only touchdown of the game. CSU’s defense has a Turnover Chain. Perhaps the gaudiest golden piece of jewelry you could imagine, with a set of gold-plated crossed swords as the main piece on a thick golden chain. It is awarded to the team’s top defensive player. On Saturday, the defense gave it to Lanier. The team’s top defensive player was Rashaun Searles who finished with a game-best 13 tackles. By the time the game ended, you couldn’t read the numbers on his mud-covered jersey. “The trenches aren’t for everybody. We don’t get no love. … When them fat boys be on top of me, anything can happen down there,” he laughed. 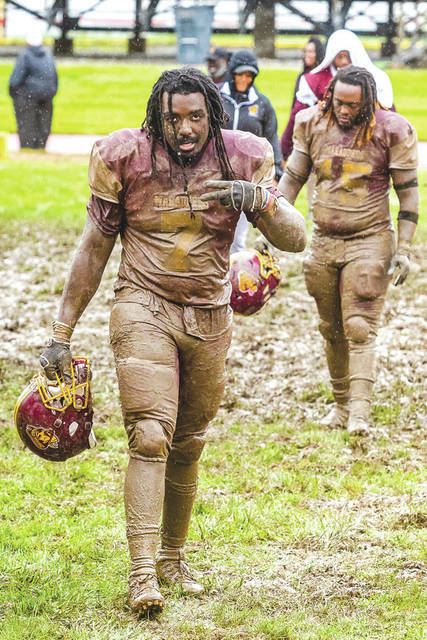 The Marauders’ Cedric Pearl said it was the muddiest football game he’d ever coached. He anticipated the lousy weather and had his offense running football drills where the ball would be soaked in a bucket of water prior to each play to make it slippery. The preparation paid dividends, as Clark State fumbled the ball 12 times and lost three of them to the Marauders. CSU had two fumbles, losing one. ““We knew what the weather was going to be like so we focused on drills to promote ball security during the week. We practiced with a wet ball which paid off dividends today. The drill is a throwback from an old coach named Henry Hulbert when I played as a long snapper at Tuskegee,” Pearl said. Just before the players headed into a very jubilant Central State lockerroom, a CSU fan opened his arms to give one of the big linemen a congratulatory embrace. The player hesitated. “I’ll get you all muddy,” the player told the older man. “It’ll wash off. Come here!” the fellow said. He’s right. Mud will disappear with the next day’s laundry. This win could be the start of something big at Central State. He’s right. Mud will wash away with the laundry, but the elation from Saturday’s win will remain for a very long time. Contact John Bombatch at 937-372-4444, Ext. 2123. You can find information on Central State Athletics at maraudersports.com .